grandma's cookie jar: grandma's cookbook - Cheddar Burgers on the Grill! grandma's cookbook - Cheddar Burgers on the Grill! Hello! Sorry for the late post today, but today, tomorrow and Thursday, my church is having their CSI (Creative Science Investigation) and I'm taking my grandsons; this is the first chance I've had to get on the computer! 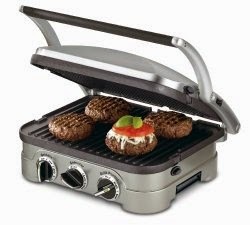 So, I wanted to just point out - in case you missed it yesterday - I am holding a second-chance give-away for the Cuisinart 5-in-1 Griddler! You'll find the specifics at this link, but I'm having the drawing in two weeks, so you have time to enter! I thought I'd share my favorite grill recipe for burgers . . .
mix the cheese with the ground meat then, add onion, olives to the middle of your burger. Sprinkle with salt, pepper and garlic; grill and enjoy! What is your favorite grill recipe? That sounds delicious! I like my burgers seasoned with salt, garlic, parmesan cheese and topped with bacon, swiss and sauteed mushrooms. A Moment to Thank You . . .
grandma's bookshelf - My Heart is Like a Zoo! Awesome LEGO Movie Blu-Ray Give-Away! Summer Fun with Pool Noodles! just for fun - Today is Fudge Day! Simple and Meaningful Father's Day Craft! crafting with grandma - Special Photo for Dad! grandma's cookbook - Raspberry Ice Cream Pie! FREE Family Resource - HomeFront Magazine!